Autodie, LLC has been producing large stamping dies in Grand Rapids for the automobile industry for over 30 years. With operations spanning 500,000 square feet in the North Monroe Business District, there is a lot of ground to cover in terms of energy inputs and the costs associated with them. Setting energy-saving goals in the manufacturing industry is not easy. Decision-makers must ask themselves many questions: How can a large machine be more efficient without producing less? Do the cost savings outweigh the investment of becoming more energy efficient? More notably, how will employees respond to the changes? 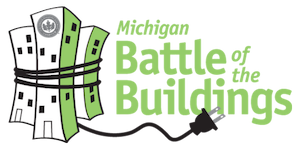 In its second year competing in Michigan Battle of the Buildings, Autodie, LLC addressed these questions with enthusiasm, and set a goal of a 15 percent energy reduction for the 2016 calendar year. The company in fact surpassed its goal and saved nearly 17 percent in its energy input. Pictured from left to right: Brian Doyle-Autodie LLC, Mary Nicholson-Autodie LLC, and Scott Cornell-FCA (Fiat Chrysler Automobiles). A lot of the credit goes to the hardworking employees of Autodie, LLC. As part of practicing world class manufacturing, the company established an “Energy Pillar Team” that works together to spread awareness and seek new opportunities to save energy. For example, employees went beyond simply turning off lights, by disconnecting 24 percent of existing lighting systems, with no appreciable effect on their work. For hot summer days, Autodie, LLC installed a new building management system to monitor and control its 20 roof-top air conditioning units. An air leak management program proactively identifies and repairs compressed air leaks in the plant-wide pneumatic machine and tool systems, to further reduce energy use. Autodie, LLC has taken further steps by installing individual meters at the machine level. The information gathered by metering has enabled the company to identify the most energy-efficient machines and prioritize which ones are used for specific projects. Although Autodie, LLC exceeded its efficiency goals, a new production stamping line will require added effort to continue reducing its energy inputs and maximize savings. The company has plans to replace outdated air conditioning units and boiler systems in the near future. It will also continue updating facility lighting systems to meet its ongoing energy reduction goals. Autodie, LLC’s efforts have achieved other notable benefits. Local utility Consumers Energy has provided rebates for reduced energy usage, and the company has earned ISO 50001 energy management system certification. Last but not least, Autodie, LLC has saved an impressive $150,000 in energy costs since 2015.